I also tried installing via the RUN file : link. After executing the RUN file and rebooting, my screen resolution is stuck at 640 X 480. I have a FHD screen. I have run sudo apt-get purge nvidia-* again, and now want to ask how can I ask fix this problem. Right now I have nothing relevant to Nvidia on my system. Running sudo dpkg --get-selections | grep nvidia gives me an empty result. My screen resolution is still 640 X 480. I tried uninstalling using the run file, and it asked me if I want to bring back the backedup x settings. I clicked yes. After uninstall & reboot, the desktop just had a wallpaper. I rebooted again. Right now desktop looks normal. My system settings still shows Graphics : unknown. How do I tell if my display drivers are configured correctly ? and a window titled Nvidia X Server Settings pops up. Does this mean everything is ok , despite settings telling me unknown graphics ? I tried installing mesa-utils, now instead of showing unknown graphics, it shows it as blank :P .. is that better ? Does this indicate everything is in order ? Should I go ahead & enable 304 ? Graphics settings is still blank. What is left to do ?? With no one replying ... I am installing the last entry in the list, and deactivating 304. Now I will try sudo nvidia-xconfig & a reboot. fingers crossed .. 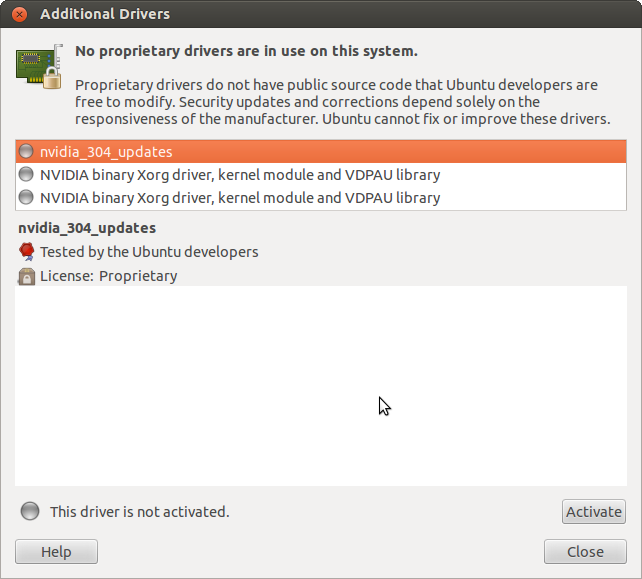 I am not sure but think so Ubuntu not providing Nvidia latest driver version directly. You need to get help from Nvidia. 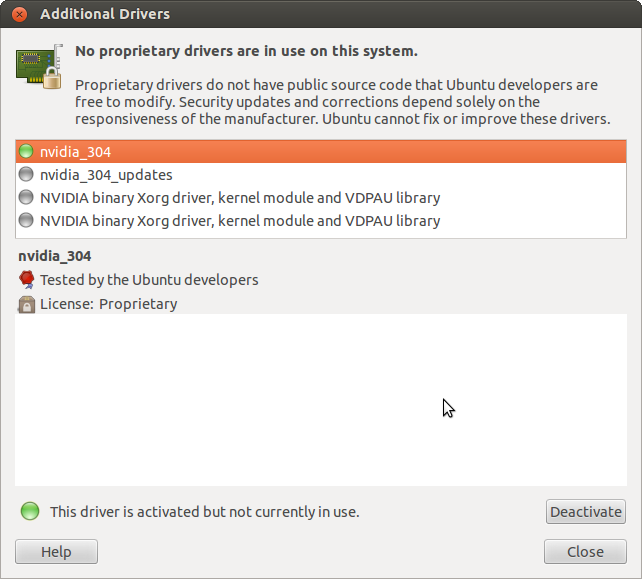 I think you need latest driver version, remove 331 that already installed, you can get Nvidia various driver version. Latest released on July 10, 2014. You will need bumblebee to enable the nvidia gpu. *If you update the driver you will have to edit this file and adjust the settings. Not the answer you're looking for? Browse other questions tagged 12.04 drivers nvidia graphics resolution or ask your own question. 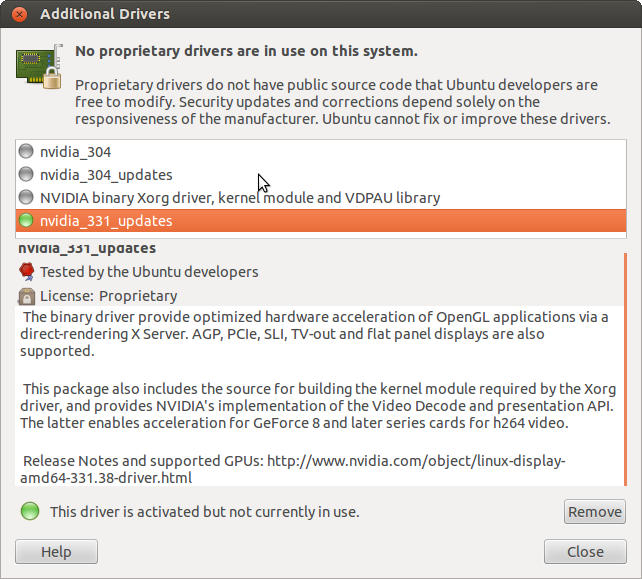 Is a NVIDIA GeForce with Optimus Technology supported by Ubuntu? After nvidia driver update screen is 640x480. How to undo? How do I enable Extra Visual Effects using an Intel graphics controller? Problem with nVidia drivers (how do I apply a patch)? How to solve low performance on Ubuntu 15.10 with nVidia 650M, various drivers?